Our team at Walsh King believes in giving back to the community. This September our team participated in two golfing events raising funds for good causes with good people. 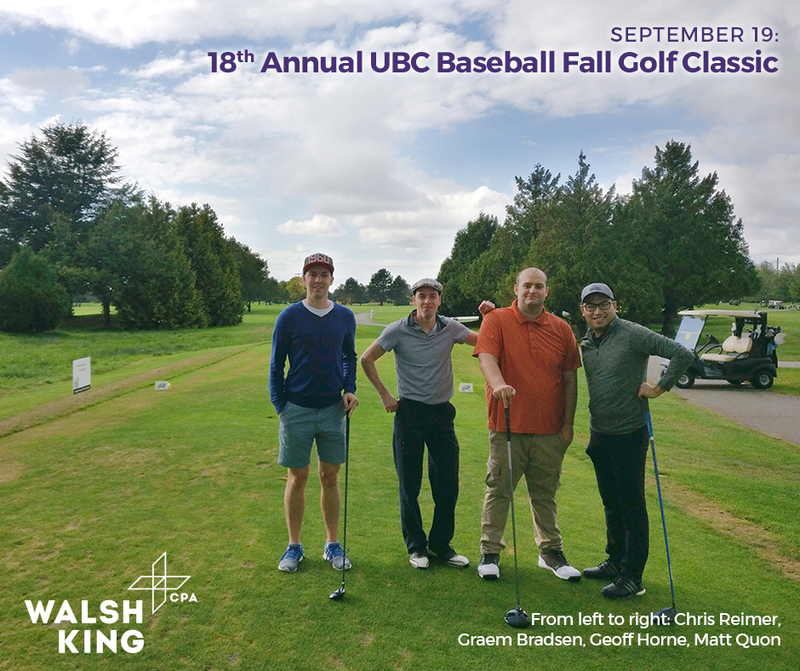 On September 11th, members of our team participated in the 44th annual Vancouver Golf Tournament at the Marine Golf course. Three Walsh King LLP partners are Vancouver College alumni, and we are proud to have been their auditors since the late 1990s. We look forward to attending this annual event as part of our commitment to supporting education and giving back to families in need. Funds raised from this event in part go towards ensuring that no boy is turned away by offering financial assistance to 100 – 130 boys annually. In addition, these fundraising efforts help the Next Century campaign, which aides in the campus redevelopment project, the financial assistance program, and educational support. Walsh King LLP also fielded a foursome for the 18th Annual UBC Friends of Thunderbird Baseball Fall Golf Classic held at Mayfair Lakes on September 19th. Walsh King has a great relationship with the Reid family who are strong supporters of Thunderbird baseball and this event that provides young athletes with financial and educational assistance. Despite the less than ideal weather, we all had a great time while raising scholarship funds for some very deserving Canadian student athletes.